My nephew Tom DeSimone has been writing a blog about thinking deeply and living simply in Gardiner, NY. His most recent posting referred to a dinner of wild garlic mustard pesto and a side of hosta shoots. Hostas? I went straight to the garden where I thought I had dozens of hostas just coming up. A week of rain has encouraged most of my hostas to unfurl. Still, I found three or four plants at the early stage of sprouting, two of which I had planned to move anyway. Using a sharp paring knife, I cut one short, tightly wound shoot close to the soil, rinsed it well under cold water, and ate. Cool and crisp, with the dense snap and fresh green flavor of asparagus, hosta leaves a slightly bitter after-taste that quickly dissipates. It was wonderful! The excitement sent me to the web to learn more about eating hostas, something not much done in the states. In Japan farmers in the mountains of Hokkaido grow hostas as a cash crop. The leaf stems (petioles) are called urui. 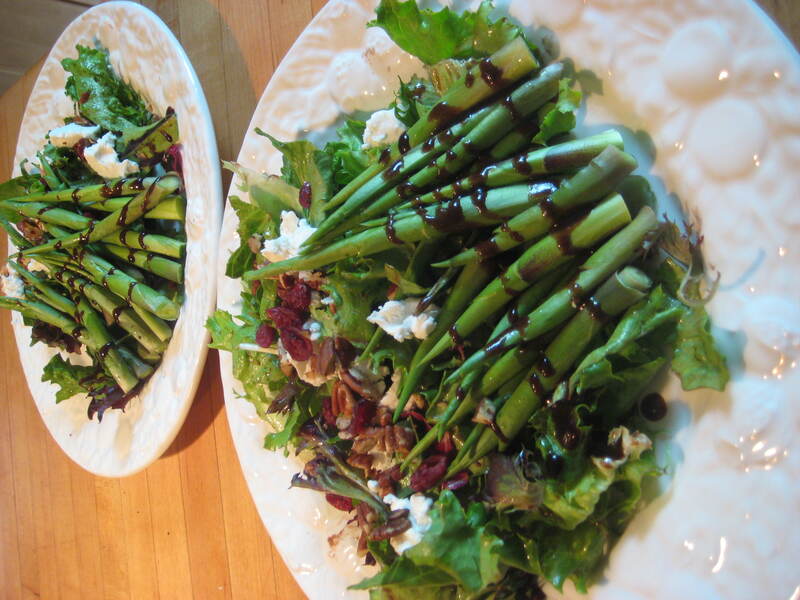 Like many green vegetables, asparagus and hostas are best cut when young and tender. 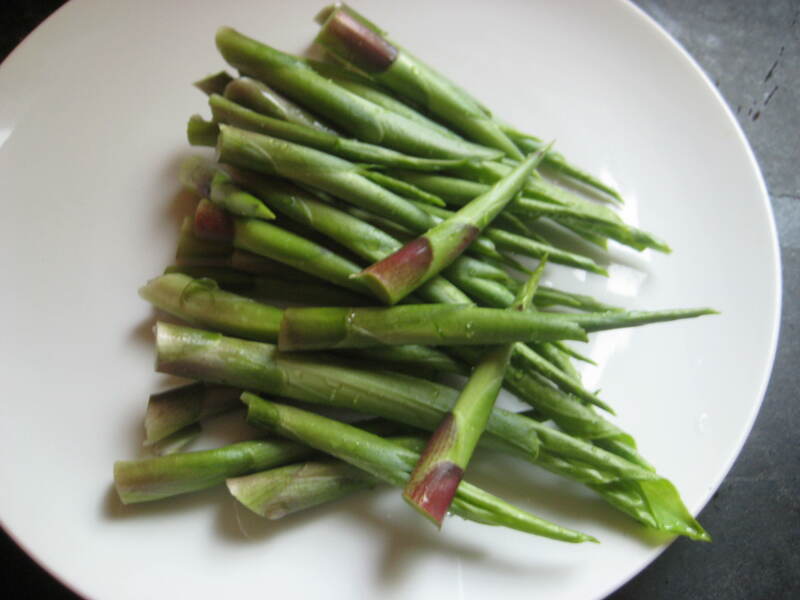 The stems can be eaten raw or cooked but they are bitter when taken from mature plants. In some parts of the Nikko area hostas are considered the best wild vegetable for pickling. Other recipes include shoots or large leaves rolled into sushi or fried, tempura style. Gardeners, who want to eat their hostas they should grow them in an organic vegetable plot or perennial bed. Hostas are best harvested in the morning hours when they are cool and moist. Since this is my first foray into eating hostas, I’m going with simple presentations. Lunch was a crisp salad of hosta shoots served over baby greens (if only I had arugula!) dressed with a reduced balsamic vinaigrette, crumbled fresh goat cheese (from Vermont Butter and Cheese Creamery), and toasted pecans. A reduced balsamic is a silky emulsification, a little sweet, and in vinaigrette it clings to greens or roasted beets, creates painterly drizzled on risotto cakes or grilled salmon. Great with fresh fruit (commonly offered with strawberries), cheeses, grilled meats and frittatas. Surprisingly easy yet rich, intense and impressive. True balsamic vinegar tradizionale is made from cooked grape juice slowly aged in a variety of wooden casks for a minimum of 12 years, slowly evaporating excess water, developing an intense and complex set of flavors. The longer the aging the better the resulting vinegar. Reducing (boiling off the water content) transforms an inexpensive balsamic vinegar into a sweeter, intense syrup. You start with a good quality but inexpensive balsamic. Check the label carefully – you want one with only three ingredients on the label, sweetened with reduced grape juice. You can slowly reduce a full bottle of vinegar which can save you time on future recipes, but making a small batch can be quite quick so I usually make it as needed. Pour the balsamic into a heavy-bottomed, non-reactive pan on low heat. Vent your kitchen to avoid filling it with lingering vinegar fumes. You’ll soon learn not to inhale too deeply from the pot! As it reaches a simmer, allow it to reduce for a couple minutes or so. Check periodically to make sure the syrup doesn’t reduce too far and burn. The balsamic should look like a light syrup. Turn off the heat. If you want to make a larger quantity you can use the whole bottle, following the same steps. Reduce by half for concentrated flavor that is still liquid. Reduce by 2/3 to yield a syrupy liquid vinegar. Either can be used in vinaigrettes. The syrup is what you want to serve with berries. Syrup improves if you let the flavors mingle for a week. For the salad: Dress greens in a bowl and mound on a plate. Place 6 to 8 hosta shoots per person on each plate and drizzle with vinaigrette. Crumble about 1 oz of goat cheese per person over the greens, sprinkle with 1/8 c of toasted pecans and serve. I wanted to fit ramps into this posting, sure as I am that they will combine well with hosta shoots, but I discovered the hostas too late. Next year. This entry was posted in Gardening, Salads, Sauces, Wild and tagged balsamic, goat cheese, greens, ramps, shallots, vinaigrette. Bookmark the permalink. I was out gardening and we have lots of hosta’s because they grow and multiply. We separate them to get good ground cover. Well I was wondering what it would be like to use the leaves to wrap fish and steam them. Like banana leaves ? First I wanted to be sure that my experiment would not be fatal. I will be fishing soon and will try to steam a striped bass fillet in hosta leaves. 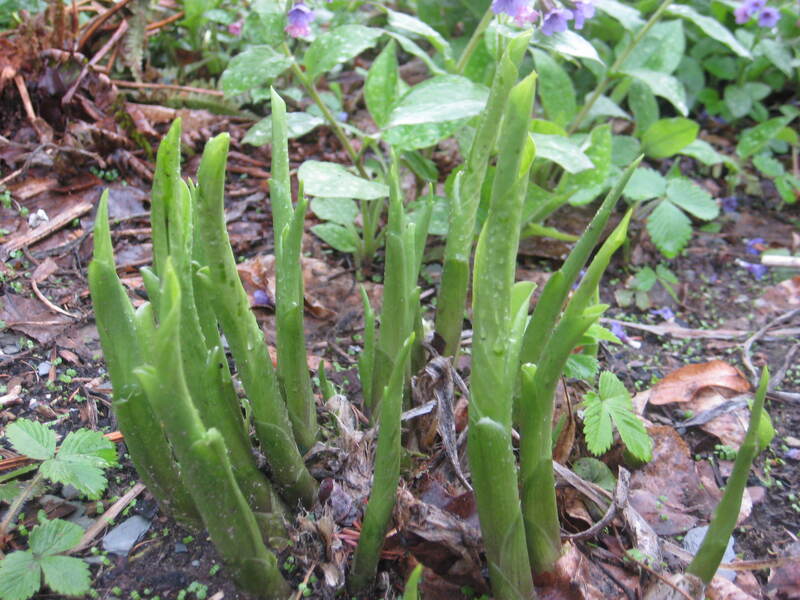 Hosta are indeed eaten, especially in Japan – though it seems that the preference is to the stems (petioles). The leaves are not harmful, I just don’t know what flavor they may impart – it should be subtle with perhaps a little bitterness. Give it a try and let me know how it turns out!